The Bowflex Treadclimber TC6000 is Nautilus’s top-of-the-line model of the new stairclimber, elliptical and treadmill combo. Using dual platforms, it works well as an elliptical and as a stair climber. 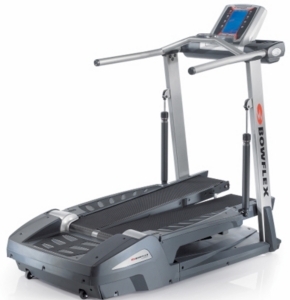 The treadmill aspect of the Bowflex TC6000 is a little odd, however, because of the short length of the plates. You can’t actually run on a treadclimber, for one thing, and the walking stride feels a bit unnatural even with the treadles locked in place. UPDATE: This model is no longer available. Bowflex has introduced all new TreadClimbers to replace the TC6000. Ask users what they think about the Bowflex Treadclimber TC6000 and they will generally give a “thumbs sideways”. 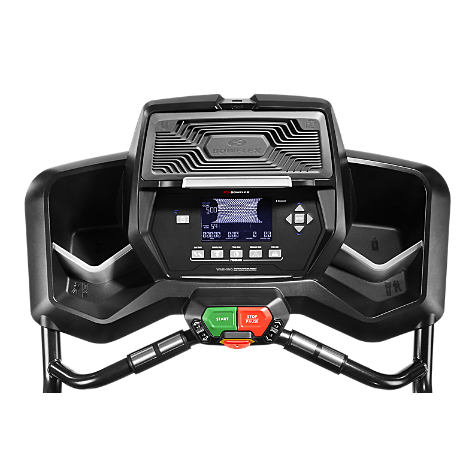 Yes, you will get an intense fitness workout on the machine and you’ll love the flexibility of 3-in-1 design, but on the downside the TC6000 is very loud and very heavy to deal with at home. And if you do have problems with your Treadclimber your problems have just begun: customer service from Bowflex can be the pits. Again, Bowflex Treadclimbers are great as stairclimber/elliptical combos, but the TC6000 sorely lacks as a treadmill. It’s an unnatural gait and the reason you like treadmills is that you can walk and swing your arms and not have to hold on. Not so with these machines. 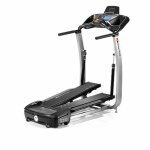 Many Bowflex Treadclimber reviews remark on the difficulty of adjusting to the machine for simply walking on the TC6000’s short 42” platforms. You’ll need a wider body stance, more like hiking, where you have to lift your feet higher as you step to keep from striking the edges of the footpads. And did we mention there is no running room? Overall, we like the idea of a hybrid machine, but the design of the Bowflex TC6000 is not worth the money. The motor is small, it’s noisy, and the customer service from Nautilus can only be described as hit-or-miss. You will find this treadclimber a challenge to assemble, and you’ll wonder what would cause this thing to be priced at $3399, especially with such limited warranties. Let’s hope Nautilus improves the design and motor of the Bowflex Treadclimber TC6000 in the future.